Chest tightness is very common, especially in middle aged and elder people. Find out its exact causes to make sure you know how to heal it properly. Tightness in chest is one of the most common conditions in middle aged and elder individuals. In this age group, it is usually due to heart diseases. Chest tightness in young age is more likely to be due to a condition not related to heart. Some of the common conditions that can result in chest tightness in this age group are asthma, costochondritis, anxiety and pericarditis. Chest tightness in middle aged and older individuals has been classically associated with the angina pectoris. The anginal pain is often felt as substernal chest tightness and is often caused by stressful physical activities. The pain or the tightness is usually relieved by rest. The pain or tightness might be felt radiating to the neck or the left arm. Angina occurs due to inadequate supply of blood to heart muscles. This may occur due to a variety of causes, for e.g. increased muscle mass and oxygen demand in hypertension, abnormal narrowing of the coronary vessels in ischemic heart diseases, etc. Anginal pain requires thorough evaluation and adequate treatment (depending upon the cause). If left untreated, it can lead to heart attack in the future. 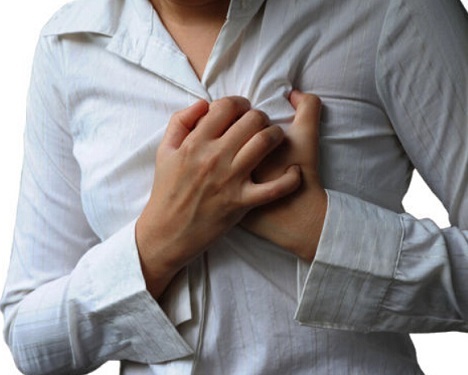 Chest pain or tightness in chest is one of the common symptoms of anxiety and panic attacks. Chest tightness in anxiety and panic attacks can be associated with any of the numerous other symptoms that can occur. Occasionally, symptoms of panic attacks can mimic heart attack. Chest tightness due to anxiety can occur in any age group, although it is more likely to be in younger people. More serious conditions like heart attack, pulmonary embolism (clot in the lung), and aortic dissection (tear in aorta) typically present with very severe chest pain. However, due to high prevalence of diabetes mellitus and the subsequent neuropathy associated with it, chest tightness might be the only initial symptom perceived in these potentially fatal conditions. The diabetic neuropathy results in reduced perception of pain and this becomes more common with increasing duration of diabetes mellitus and with poorly controlled blood glucose levels in diabetes. Misperception of chest pain due to aforementioned conditions can lead to delay in seeking medical care and can be fatal sometimes. Chest tightness is a symptom. Therefore, treatment of chest tightness will depend on the disease condition causing this symptom. Evaluation of chest tightness often involves various investigations like EKG (ECG), chest X-ray, serum enzymes marker for heart attack (e.g. Troponins), etc. Other investigations depend upon the other suspected causes. Future course and complications of tightness in chest also depend on the cause.